Our roots date back to 1956. We are proud of that heritage, and of the many milestones achieved. 1956 Company formed as Perry Submarine Builders by John H. Perry Jr., Publisher of the Palm Beach Post Times Newspaper and 26 other Florida and Bahamian Newspapers. Initial operations were housed in the Lantana, Florida Boatyard. While at this location, the three man Company designed and built the early “Perry Submarines”. These were small 1 and 2 man submarines named PC-1, PC-2 and PC-3 series which ranged in depth capability from 150 ft of sea water (FSW) to 600 FSW. 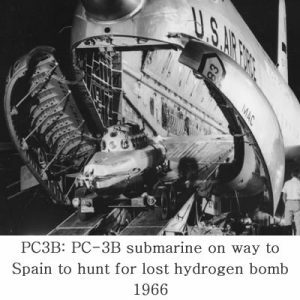 The PC3B was used in the search for a lost Hydrogen Bomb in the sea off the Coast of Spain in March of 1966 after the crash of a USAF B-52. 1965 Perry Submarine Builders purchased land and built new and larger facilities at the foot of 17th street in Riviera Beach Florida. 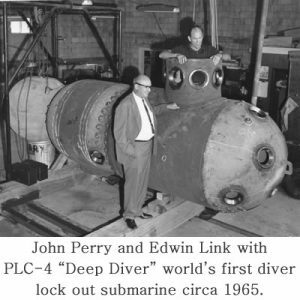 John Perry and Edwin Link (Link was inventor of the Link Trainer used to train World War II pilots) joined forces in 1965 to design and build the world’s first diver lock out submarine Deep Diver..
1966 Perry received it first commercial contract to design and build a one atmosphere diving bell for Taylor Salvage and Diving of New Orleans for use in the Offshore Oil Industry. 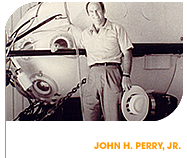 1968 Perry Submarine Builders designed and manufactured its first Diver Decompression Chambers for the Offshore Industry. 1969 Company name changed to Perry Oceanographics. Over the next 15 years, the Company grew to more than 400 employees and expanded to additional facilities at the Port of Palm Beach. During this period, the Company designed and developed numerous submersibles, saturation diving systems, remote controlled unmanned vehicles both for commercial markets in the Gulf of Mexico, The North Sea, The South China Sea, and Offshore Brazil as well as military programs for the U.S. Government. 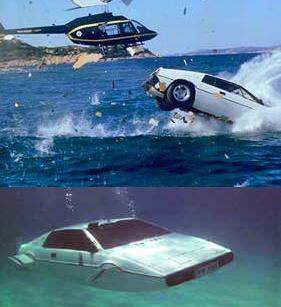 1976/77 Manufactured and delivered the Lotus underwater car for the James Bond Film “The Spy who Loved Me”. 1979 Perry Oceanographics formed a new Division within the Company, named Perry Baromedical for the purpose of the design and manufacture of Hyperbaric Chambers for the Medical Industry. 1986 Perry Baromedical Division delivered the first Sigma II, the world’s first acrylic Multiplace Hyperbaric Chamber to St. Mary’s Hospital, West Palm Beach Florida. 1989 John Perry sold all of his holdings and devoted his time to the development of a Hydrogen powered automobile. The Company was split into three parts. The military contract business was sold to what is today, The Lockheed Corporation, operating as Perry Technologies. The remaining underwater business consisting of Diving Systems and Unmanned Vehicles was sold to a Scandinavian Investment Group and renamed Perry Tritech. The Hyperbaric Chamber business was sold to a Perry Oceanographics Vice President named Mr. Ty Merritt. Renamed Perry Baromedical Corporation, the Company relocated to a facility off Garden Road in Riviera Beach Florida to continue with the design and manufacture of Hyperbaric Chamber Systems. 1989 Perry Baromedical Corporation introduced the Sigma I, its first Monoplace Hyperbaric Chamber System. 1992 Mr.Ty Merritt sold Perry Baromedical Corporation to Adatif International of Montreal, Canada, owned by Mr. Kerrigan Turner, the current owner. 1995 Perry Baromedical designed and introduced the Sigma Plus, the World’s largest Monoplace Chamber. This 40 inch diameter Monoplace Chamber provided a major advance in both patient comfort and acrylic tube technology. 1996 Perry established a new Division and opened its first Hyperbaric and Wound Care Clinic with the Columbia Hospital Corporation of Louisville, KY in Palm Beach County Florida. A second Wound Care Clinic was opened later that year with the Columbia Hospital in Macon, GA. By the close of the year, this Division was sold to US Diagnostics and became known as Diversified Therapy Corporation (DTC). Using primarily the newly introduced Sigma Plus Monoplace Chamber, DTC proceeded to become the largest Hyperbaric and Wound Care Clinic in the Country. 2002 Perry introduced the Sigma 34 Monoplace Hyperbaric Unit as a new and larger sized internal diameter HBO unit to replace the outdated 25 inch internal diameter Sigma I. 2006 Perry introduced the Sigma 40 as the largest monoplace hyperbaric unit in the world. The Perry Sigma 40 Hyperbaric system has an internal volume of 98.3 cu.ft making it the widest and longest monoplace hyperbaric unit on the globe, providing the largest patient comfort cabin in the hyperbaric industry. 2008 Perry added the Sigma 36 to its product line and commenced research on a web based software application to monitor patient and equipment during treatment. 2009 Perry introduced its “Sigma ELITE” product, a unique computer controlled unit and monitoring system, with provisions for interface to hospital EMR Systems. Perry added multi-year service maintenance agreements to better serve our clients and the growing HBOT support market. Perry announces the launch of the “Sigma Elite” with EMR, with extended patient data capture capability. The advanced technology of the Sigma Elite is available on each monoplace chamber model currently available. Perry announces three new hyperbaric training options for onsite training and factory technician training to serve the growing educational and training needs for sites around the world. 2011 Perry announces the launch of the Sigma 40-II. The Sigma 40-II Hyperbaric Chamber System provides hyperbaric oxygen therapy for two patients. The system is pressurized with medical grade air. Patients are seated in comfortable, adjustable, fully padded treatment chairs. Patients breathe pure oxygen through a built in breathing system (BIBS), using “Duke” style hoods.